With US wholesale consumer fitness equipment sales of $3.77 billion in 2015 alone, it's safe to say people want to get into shape. For some, it's a bid to improve their overall fitness. Others are chasing specific end goals, like improving core strength or losing weight based on their doctor's orders. What if you're looking to build strength and mass? Strength is partially achievable through calisthenics, but mass is non-negotiable. Your body has a natural mass where it's happy. Adding to that mass demands weight training. Odds are, you'll do some of that training with free weights. Even in the realm of free weights, though, opinions differ on which equipment is better. One of the main debates: barbell or dumbbell? It might seem like an odd question initially. Barbells and dumbbells don't look like they serve the same function. Yet, they frequently do. Let's dig into their advantages and see which one comes out on top. When it comes to barbell or dumbbell for beginners, dumbbells are generally safer. Dumbbells let you learn the lifting techniques with less risk. A real risk with barbell bench presses is getting pinned under the bar. This can happen if you put too much weight on the bar. It can also happen if your muscles fatigue to the point of failure. If your dumbbells are too heavy or you reach failure, you can always drop them to either side. You can learn the bench press without the threat of getting pinned under the bar. If the weight is too much or your muscles fatigue to the point of failure, you can drop the weights to either side. Dumbbells give you a better range of motion during your training with some exercises. This leads to a better muscle workout overall, as more of the muscle gets resistance for longer on each rep. 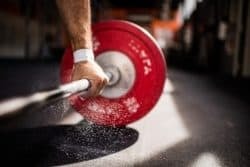 Weight training with a better range of motion generates more mass and builds strength faster than the same exercise with a shorter range of motion. Did you ever notice how it's harder to lift things with your non-dominant hand? That's strength and muscle inequality. You use your dominant hand more, so the muscles on that side are better developed. When you're new to weight training that unequal development can continue with barbells. You'll unintentionally let your dominant arm do more of the work. Dumbbells help you avoid this problem. Since the dumbbells are independent, both sides of your body must do the same amount of work to get the dumbbells from point A to point Z. This ensures muscle building happens at the same rate. You can also work your non-dominant side more to offset the initial imbalance in muscle mass. On the question of barbells or dumbbells at higher weights, barbells are often safer. When doing bench presses, for example, dumbbells start on the floor. You have to lift and position them before you even start the presses. It's low-risk at lower weights, but the odds of injury from a bad movement increase at higher weights. The barbell is already in position over you. You never need to do anything outside of the bench press technique. This minimizes the chances of moving in a way that could injure you. Using a barbell during squats means the weight gets even distribution across your spine. It's easier to misalign dumbbells. That leads to an uneven distribution of weight and increases your chances of injury. Dumbbells use more stabilizer muscles. This is good for improving overall muscle building and athleticism, but bad for the total weight you can lift. Barbells reduce the number of stabilizer muscles used in any given lift. By concentrating resistance onto mover muscles, the barbell actually lets you use more weight. Barbells let you pack on mass faster. Dumbbells get made in 5-pound increments. Barbell weights get made in 2.5-pound increments. Adding weight incrementally is the best way to add body mass. The barbell lets you add that weight 5 pounds at a time. That means you can add more often without sacrificing a lot of reps.
Moving up to the next set of dumbbells means adding 10 pounds. It's a more serious jump that will almost always cost you in reps and result in slower progress. Dumbbells over 100 pounds exist. However, they aren't common in gyms or home sets. Unless you plan to special order some of the heavier ones, assume 100 pounds per hand is the heaviest weight you can get. Barbells don't have from this problem. Their upward incrementation is mostly limited by your strength, your goals, and even the equipment at your gym. That makes them more practical once you crack that 200-pound squat or deadlift. So which one wins? Barbell or dumbbell? The answer to that question is that there isn't a catch-all answer to that question. It boils down to where you are at in your training and what you're looking to achieve. For the absolute beginner, the dumbbell is probably the winner. The dumbbell adds a layer of safety while you learn the techniques. With so many weight training-related injuries per year, it's hard to put too high a priority on safety. The dumbbell also does more to strengthen stabilizer muscles, which benefits your overall muscular health and fitness. If you have experience with weight training and are focused on adding mass, the barbell is probably the winner. Being able to increment the weight up more often speeds up gaining mass. That barbells focus resistance onto mover muscles also hastens the mass gain. The true winning answer to barbell or dumbbell is to use both. Use dumbbells when it's safe and to support stabilizer muscles. Pull out the barbell for heavy lifting and to add the mass faster. The combo will give you the most overall gain in strength, mass and athleticism. Want to weigh in on this topic? Don't be shy. Let us know what you think in the comments below!